This gorgeous industrial accent cabinet is overflowing with charm and unique storage features. The upper three drawers are perfect for storing utensils and other dinnerware, while the removable wood-slat bins offer an assortment of possibilities. 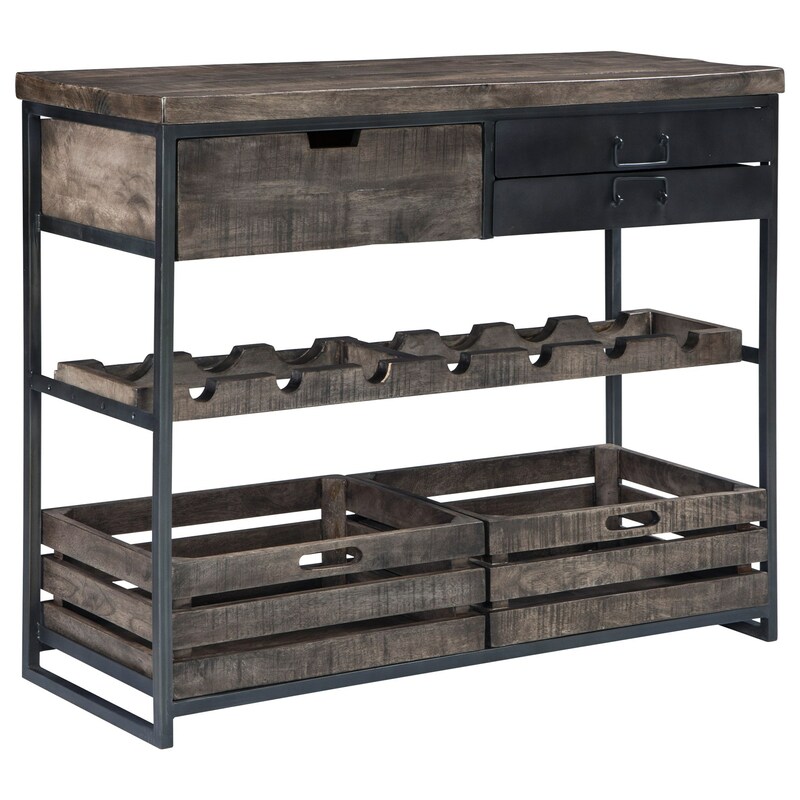 The built-in wine bottle rack makes this piece an instant seller, if you're not already enticed by the weathered finish look and black metal frame of this storage piece, which will give your home a modern farmhouse feel. The Ponder Ridge Industrial Accent Cabinet with Wine Bottle Storage by Signature Design by Ashley at Sam Levitz Furniture in the Tucson, Oro Valley, Marana, Vail, and Green Valley, AZ area. Product availability may vary. Contact us for the most current availability on this product. Storage Left drawer interior: 18.75" x 11.63" x 5.00" Right drawer interior (2): 19.00" x 13.75" x 2.63" Bottle rack opening (7): 42.25" x 10.50" x 2.00" Box: 19.13" x 14.25" x 6.50"